Find royalty in our extensive collection of timeless Princess cut solitaire diamond engagement rings. The Princess cut diamond is a symbol of royalty and luxury, designed to bring out the inner radiance of the diamond. 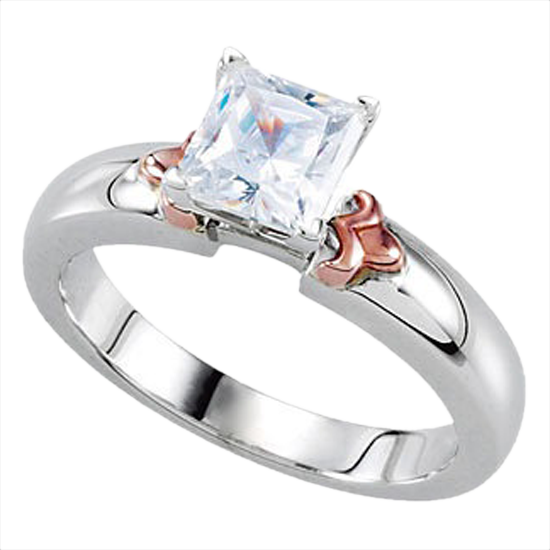 The princess cuts' square or rectangular shape is distinctive but a bit more modern than many other styles. If you want something with the fire of a round brilliant, but more unique, then this is a great choice. The Princess style, however, has sharp, uncut corners and an average 76 facets, giving it more fire and brilliance compared to round brilliants. This is the reason that Princess cut diamonds are quickly becoming the most popular cuts in the US and the world. CaratsDirect2U have a variety of sizes of Princess cut diamonds from 0.5- 3.00 carats, in a large range of clarity from VVS1 until SI3 with D-K color, as well as natural orange, cognac colors and treated blue and green colors. We also carry a large collection of two-tone Princess cut rings, which are a sophisticated alternative for brides made a great alternative for brides looking for something unique and special. For those looking for a cheaper diamond we also carry clarity enhanced and laser drilled diamonds that give off the same fire and brilliance for a fraction of the price. All of our princess cut diamonds are set in a four prong setting set in 14k white or yellow gold.